I Wonder If There is a Smorgasbord in Heaven? Later that night I wonder to myself, I wonder if their is a smorgasbord in Heaven? Last week, I took Jim, Ruth, and Dotty out to dinner at Cracker Barrel Restaurant. This proved to be a very enlightening experience. When we were leaving home both Ruth and Jim encouraged me to take the wheelchair. I said, don't worry, I'll get Dotty into the restaurant. As it turned out, it was a real struggle to get Dotty into the restaurant and seated. This was a real eye opener for me. It is getting more and more difficult to move Dotty around while on her feet. Note to self. Listen to other people. Perhaps I should have just asked Ruth and Jim, why, don't you think Dotty can make it? Get some insight and opinion from others when you can. I want to tell you, Dotty is amazing. She does not complain about the difficulty walking. She might say, my knees hurt. Or, we might have to stop so I can remind her to start breathing. Occasionally, Dotty might say, I don't know what is wrong with my legs. Dotty does say often now, I can't move. As we arrived at the hostess area I said 4 for dinner. Ruth then moved in front and quietly leaned in and said to the hostess, we need a nearby table. As it turns out there was a table right near the front, in the first section. Observation. Isn't it amazing how some people are just "so plugged in"? Ruth is the one plugged in. I was so focused on Dotty that I would not have thought to ask for the nearest table. It only gets better. Jim and Ruth immediately took the two inside chairs against the wall. This left the two outside chairs, the easiest to reach, for Dotty and me. As a result, it was very easy to get Dotty seated. Thank goodness. At this point, I am seated right across from Dotty and it is easy for me to see her, and to communicate with her. We began discussing the menu. Jim narrowed it down to three potential meals. While Jim was deciding I had my usual conversation with Dotty. I usually ask her what would you like, how about this, how about that. In the end, Dotty always says the same thing, I'll eat whatever you order. Dotty can no longer pick and choose, or decide. For me, it is still interesting to hold this discussion with her. Dotty doesn't get frustrated, and neither do I. 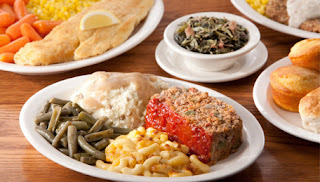 When the food arrived, Dotty had two fried catfish fillets, mashed potatoes, and green beans. Jim decided to go for broke and ordered the meat loaf. Ruth went for the chicken pot pie. Me? Country fried steak. Dotty as usual took one look at her plate and more or less said, "look at all this food, I'll never be able to eat it". Uh huh. Soon enough the waiter, John, put down a plate full of cornbread and biscuits. Dotty grabbed a cornbread before you could say, well, anything. I asked her, would you like me to put the butter on the cornbread? She answered yes. Then we got to the tricky part. They have those little miniature tubs of butter, you know those tiny things where you have to peel off the exact right corner of the little tub to get at the butter. I butter up the cornbread for Dotty, and she was already on the attack. Watching Dotty eat is fun. She really enjoys her food. She looks like a woman on a mission, a happy mission. Soon enough, Dotty goes for another cornbread. This time I just watch. Dotty tries to get the little miniature tub of butter open. She could not do it. Not to be deterred, she grabs her knife and tries to stab the butter tub right in the heart to get it open. It looks to me like she is trying to murder the butter. At this point, I reach over, stick my hand out, and say, let me do it for you. Dotty hands me the butter. All of this happens seamlessly, neither Jim or Ruth noticed that Dotty tried to stab her butter. Truth be known. I am really enjoying myself. No fuss. No bringing attention to Dotty. No reprimand. I'm laughing inside all the way to the caregiver happiness bank. I'll probably tell the story about Dotty trying to stab her butter to someone ten years in the future. I won't forget it. Here is something of great interest to me. I usually cut Dotty's food if necessary when we go out. Not this time. Dotty is working away diligently on the catfish, potatoes, and green beans. So, I let her fly. She cleans her plate. This was a man sized meal and Dotty put it away. She wasn't done yet though. She looks around, notices there is no more cornbread, and then grabs a biscuit. I ask, you sure you want that biscuit? Dotty gives me the look that indicates she is thinking, mind your own business. I ask again, and she tells me to, mind my own business. Ruth opens the butter for Dotty. Dotty eats her biscuit and she looks to me like she thinks she is in Heaven. If so, something tells me this will be the first place to look for Dotty. 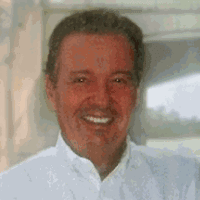 Bob DeMarco is the Founder of the Alzheimer's Reading Room and an Alzheimer's caregiver. The blog contains more than 3,361 articles with more than 397,100 links on the Internet. Bob lives in Delray Beach, FL.